If You Didn't Qualify, You're One of the Lucky Ones! What does it mean to "Qualify"? Your BMI, which determines if you're overweight. Your Age (your risk gets higher as you get older). Whether You've Been Told You're Prediabetic (of course that automatically qualifies you). Of course, if you're already Diabetic you are not at risk for diabetes. However, we do have a separate free program for those with Type 2 Diabetes (Click here). Prediabetes is the precursor to type 2 diabetes and it is reversible with lifestyle changes. Made a mistake on the quiz and want to retake it? 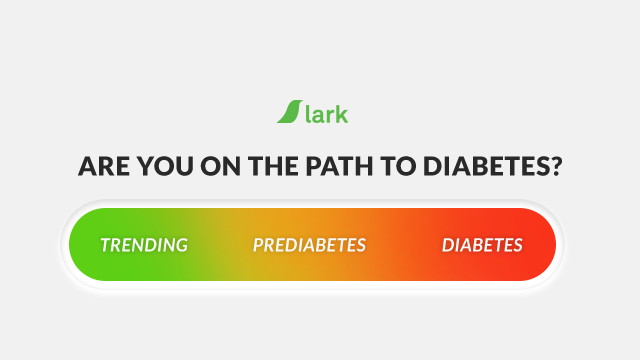 What is Lark's Diabetes Prevention Program?